The annual Filmfare awards were held in the city tonight and it was a gala affair. With stars like Shah Rukh Khan, Deepika Padukone, Alia Bhatt, Ranbir Kapoor and Janhvi Kapoor gracing the awards night, one can imagine what a gala affair it must have been. With so many prominent names coming under one roof, there are lots of picture-worthy moments that deserve your attention right away. Take this perfect click of Alia, Deepika and Ranbir for example. Isn't the picture narrating a beautiful tale? 64th Filmfare Awards 2019 Best Actor Award: Ranbir Kapoor Takes Trophy in Popular Category for Sanju; Ranveer Singh Scores in Critics’ Choice for Padmaavat. 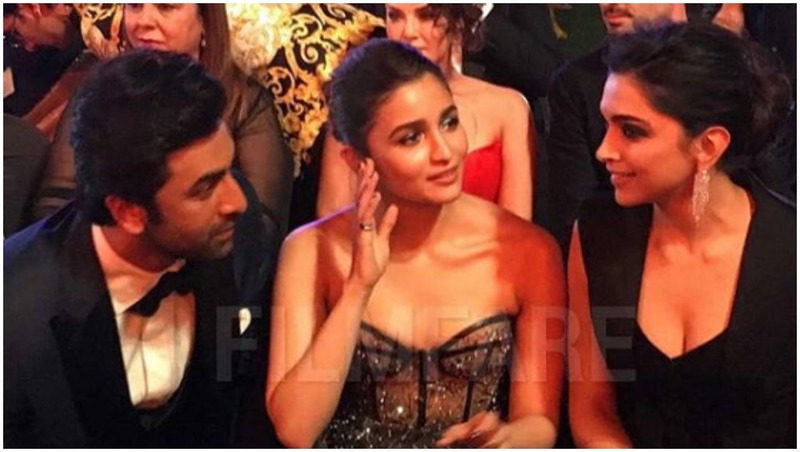 Alia Bhatt, Ranbir Kapoor and Deepika Padukone were among the first-row guests at the awards ceremony tonight. And since they were seated beside each other, DP and RK Jr were seen having an interesting conversation that Alia was simply a part of. We wonder what the trio was discussing and if being a fly on the wall would have helped us solve this query. Guess they were simply reviewing the winners of tonight performances that were sidelined by the organisers. 64th Vimal Filmfare Awards 2019: Lovebirds Ranbir Kapoor-Alia Bhatt's Stylish Avatar Makes us Say WOW- See Pics. Anyways, the picture is too intriguing and it takes us back to good ol' happy days of Bollywood. Where everyone was content with each other and all were good friends. Now, are these celebs pretending to be good allies or the bond is genuine enough? We'll let time answer this question.